Former CIA director and military general David Petraeus improperly possessed “Black Books” containing the identities of covert officers, war strategy, intelligence capabilities and other classified information, including notes from his discussions with President Barack Obama. He provided his biographer, Paula Broadwell, access to these books after she asked to use them as source material. He even lied to FBI special agents about leaking to his biographer and when he signed a CIA “security exit form.” But court documents forming the basis of a plea deal show Petraeus will face limited consequences for his crimes. The plea deal stands in sharp contrast to recent aggressive prosecutions of others responsible for leaks, people like former State Department employee Stephen Kim and former CIA officer Jeffrey Sterling. They have both faced jail time for talking to reporters about classified information (Sterling was recently convicted of violating the Espionage Act but has yet to be sentenced). The government and Petraeus’ defense agreed to a deal that involves no jail time. He will be under supervisory release or probation for two years and have to pay a $40,000 fine, which he can probably recoup by appearing at a series of prestigious speaking events. His obstruction of justice, where he lied to the FBI, was not charged but included as an aggravating factor in his sentencing. He was not charged for lying on his CIA “security exit form.” The plea also says nothing about how he was having an affair with Broadwell as she penned her book, All In: The Education of General Petraeus. The information leaked seems to be fair more sensitive than previously suggested in reports from both the Washington Post and the New York Times, which suggested the FBI had been investigating whether Petraeus gave Broadwell access to his CIA email account and other highly classified information.” The FBI had even thought Petraeus’ staff had been involved in leaking “sensitive documents at his instruction.” Petraeus apparently committed the crimes all on his own. The “factual basis” of the plea [PDF] indicates that Petraeus “maintained bound, five-by-eight inch notebooks that contained his daily schedule and unclassified notes he took during official meetings, conferences and briefings.” He had “eight such books” from the period when he was in command of the International Assistance Security Forces (ISAF) in Afghanistan. Such contents were more sensitive than anything US military whistleblower Chelsea Manning ever leaked to WikiLeaks and even more sensitive than what NSA whistleblower Edward Snowden leaked to journalists. FBI agents questioned him on October 26, 2012. He knowingly and deliberately informed agents that he had not provided classified information to Broadwell and that he had not facilitated her access to classified information. When Petraeus left the CIA on November 26, about a month later, he signed a “security exit form” that said, “I give my assurance that there is no classified material in my possession, custody or control at this time.” He was lying. FBI agents seized the “Black Books” from an unlocked desk drawer in his first-floor study on April 5, 2013. One of the clearest indicators that Petraeus engaged in egregious misconduct came in January of this year when Justice Department and FBI officials “briefed on the investigation” leaked to the press because recommended charges had been sitting on Attorney General Eric Holder’s desk for weeks if not months and no action had been taken. Petraeus still went ahead and provided Broadwell access, which means he intended to leak the classified information to Broadwell. That simply adds to the reality that he dodged being charged with committing a felony under the Espionage Act, which has been the Justice Department’s go-to statute for making an example out of leakers. Now, it is worth noting that Petraeus was charged in the Western District of North Carolina and not a district court in Virginia or Washington, DC. The crime was committed in DC, but venue shopping appears to have taken place in the process of securing a plea deal. The former CIA director signed a non-disclosure agreement (NDA)—or secrecy contract—with the CIA in June 2011. He signed an NDA in March 2006. He entered into 13 additional NDAs over the course of his Defense Department employment. The court documents from Petraeus’ deal show that Petraeus had leaked the “Black Books” to his biographer just over a year ago when he put his name to this statement scolding Kiriakou. He believed he was “above the laws that protect our fellow officers” and endangered covert agents. He did not have control over what Broadwell would do. She could have shared that sensitive material with anyone or copied it for herself to use later. Additionally, Kiriakou was able to convince the government to give him a plea deal, but it was not nearly as super-lenient as Petraeus’ deal. He could only get a deal that involved a 30-month sentence. Though it was agreed that Kiriakou would serve time in a minimum security work camp, the Bureau of Prisons violated the agreement and sent him to a low security facility in Loretto, Pennsylvania. And all Kiriakou did was confirm the name of covert agent to a reporter, who already had the name, and the name was never published. “The government has used the Espionage Act to overzealously prosecute GAP’s whistleblower clients and threaten them with decades in prison. Petraeus’ cushy plea deal makes crystal clear that the government has more than enough tools to punish leaks without resorting to the heavy-handed Espionage Act,” Radack stated. General Petraus willingly and knowingly removed, retained and disclosed highly classified information to someone not authorized to receive it. This action served no public good. I used every internal channel available to me as a whistleblower, and revealed only unclassified information evidencing massive waste, fraud, abuse and illegality to the tune of $4 billion. Yet I was charged with ten felony counts, five under the Espionage Act, and was labeled an enemy of the state, while General Petraus received a slap on the wrist. The government’s message is clear ­­– whistleblowing in the public interest will be punished, while disclosing classified information devoid of public value will get you a pass. Last week, I interviewed Kiriakou and asked him about Petraeus. During the hour-long conversation, he explained that he did not think Petraeus should be prosecuted. The critical question is why the Justice Department has not relied upon this statute instead of the Espionage Act. It seems to be far more appropriate than the World War I-era law that has been the weapon of choice of prosecutors. Also, does this signify a new normal, that high-level government employees will be charged with violating this law and be permitted to get away with lying about leaking while other low-level government employees who leak are labeled as traitors? 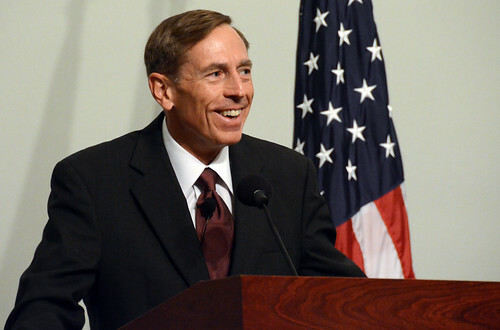 Recognize that Petraeus is not going to have his character assassinated like previous leakers. He is so widely revered by the political elites in Washington that not only did they protest a Justice Department prosecution of him, but they will now rationalize, excuse or ignore his criminal conduct because they consider him to be the most exceptional military general of the 21st Century. He will not be publicly scolded for being irresponsible with state secrets by President Obama. Petraeus, unlike other prosecuted whistleblowers or leakers, will get to put all this behind him and proceed onward as if he never did anything wrong at all. Photo from the Central Intelligence Agency and in the public domain, as it is US government work.